OK, snakes aren’t everybodies mostest favorite thing but, they are actually useful critters. Even the venomous ones. On Friday, I was trimming one of my small palm trees. I’m not sure of the type but, they are usually planted in pairs, have curved trunks and a ruff of dead frond material around the top. As I started pulling out the dead leaves and cutting them, I noticed a bit of an unusual color and texture in the ruff. When I took a closer look, I found this Corn Snake – Elaphe guttata coiled in the ruff. After moving down from Maryland, I thought it was a Copperhead until I checked the range and coloration. It reminded me of another snake I had found climbing the same tree. 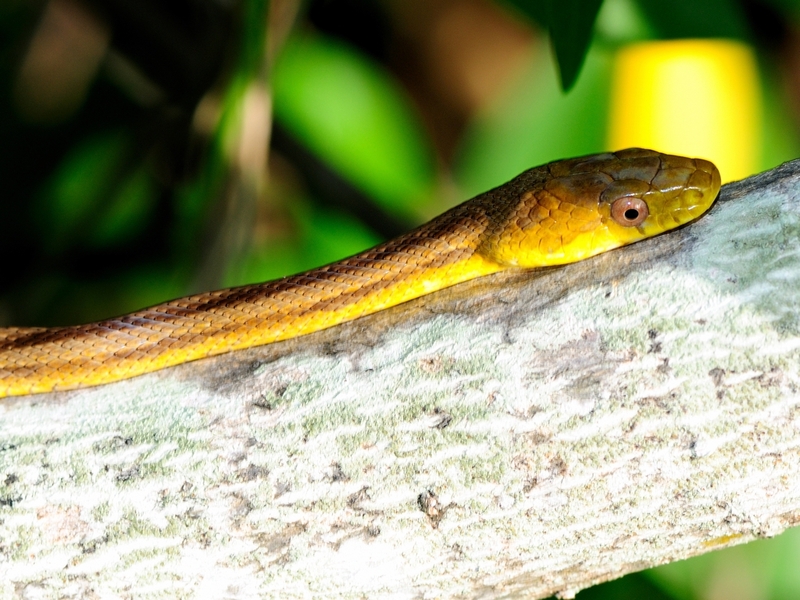 It was a Black Rat Snake – Elaphe obsoleta obsoleta and a Yellow Rat Snake – Elaphe obsoleta quadrivittata I had found in Ponce de Leon Park. Here are their pictures, just click for a larger view. They all reminded me of an airboat ride in the Everglades near Everglades City. The airboat driver pointed out that, in Florida, snakes can climb trees and that sometimes one gets knocked into the boat by accident. The airboat drivers are all trained in snake recognition and know which are venomous and which are not. We were instructed that in the event of a snake falling into the boat, we should look around to the driver. If he was still in the boat, the snake was NOT poisonous. 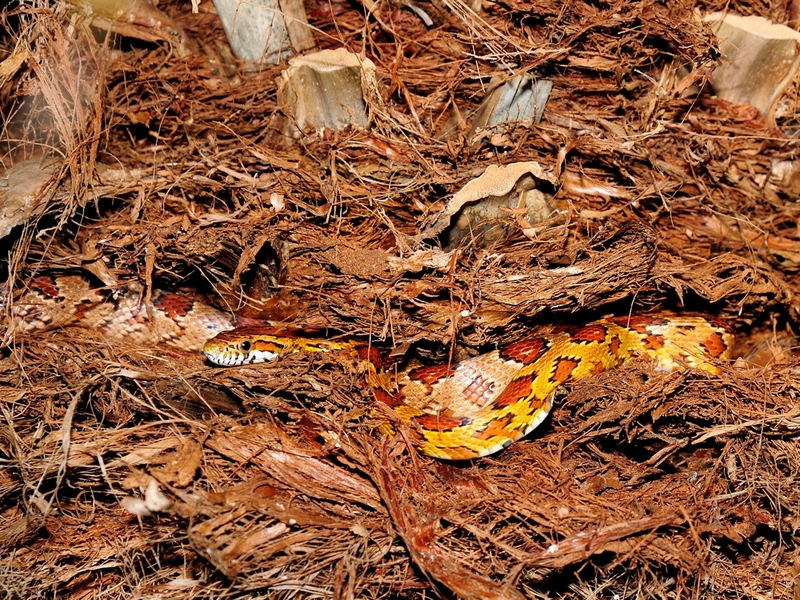 This entry was posted in Park - Ponce de Leon, reptile and tagged black rat snake, Corn Snake, Photography, yellow rat snake. Bookmark the permalink. 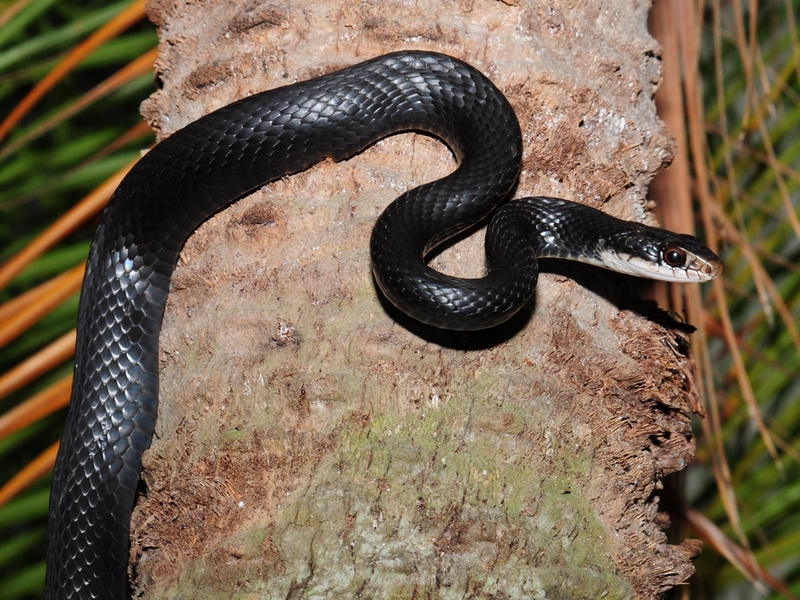 Actually the black snake pictured above is a black racer (Coluber constrictor), not a black rat snake. Indeed it is a black racer. If you’ll notice, the scales aren’t keeled. Rat snakes have keeled scales. Their heads are way different too.